I decided on the “clockwise” alternative of the stage I initially set, including the Fedaia from Rocca Pietore. I first descended to La Villa and climbed the Valparola. That already seemed to be harder than I remembered, but the descent of the Falzarego and onwards to Caprile didn’t do me a lot of good. I hadn’t looked at the profile of the Fedaia – I just knew it was supposed to be “more challenging” than the climb from the other end, which was more or less a recovery ride in 2011. The first part of it didn’t seem that bad, but after some 7 kilometers, the road went up in an almost straight line, at an incline of 11 to 12%. It didn’t get any better after that, as during the “winding” part – stunning as that may look – the grades rose to 15%, topping 18%. 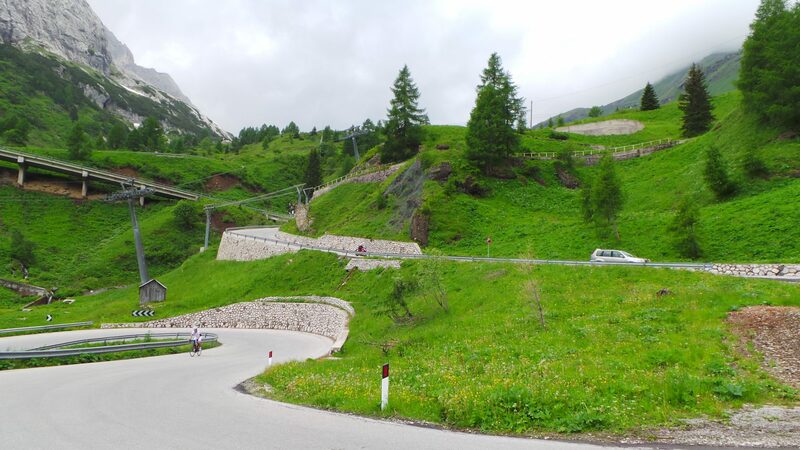 I then descended towards Canazei and got up the Sella, which has the bottom 14 hairpins in common with the Pordoi. After the split – 6.5 kilometers from the start – the Sella hairpins count downwards again (from 10 – 1). I was “certain” the Sella did not have stretches of over 10%, but it does. And they hurt. After the short downhill towards Plan de Gralba, I was hoping for a merciful Gardena to finish the day.